Ryan from Art of lock picking sent me a bunch of good stuff about Lock picking techniques. Below are a few infographics on raking, using a single pin and which states in the USA have laws against lock picking. If you want to practice, there are a ton of practice kits available that include locks with different pin counts that can also be see through to help you visualize what is happening. Personally, I believe its about learning the feeling of pushing pins and would recommend a cheap kit or just find a door to play on. Many security conferences also have lock pick villages that will sell this stuff as well. 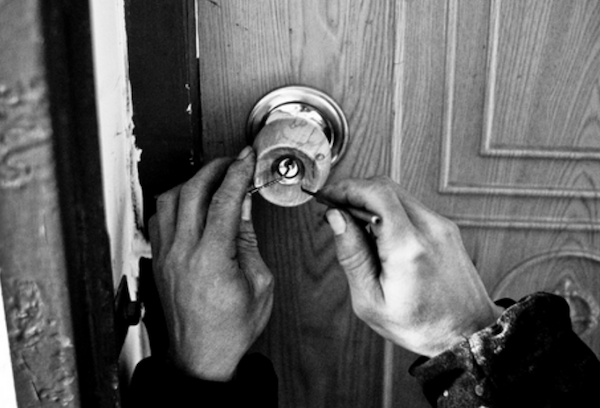 If you are going to learn, take the time to learn the single pin technique as tools like bump keys and lock guns are not as effective and a less skilled approach to bypassing door locks. I personally spent a ton more time trying to get a gun work once verses the good old pick and torque tool. For those that are thinking “why are you putting this out there”? Its important to know what could be used against your locks. I found at Home depot you can by a smart key lock that is pick proof for 25-35 dollars. Smart key means you put a key inside of it and it will learn your new key format meaning you don’t have to pay a lock smith to re-key your entire house. So if you have a concern of having your doors bypassed in this manner, invest a little more into better locks or beef up other defenses like an alarm. Ignorance to a threat is never a good approach!